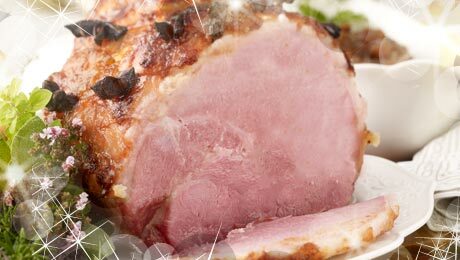 Ham is my favourite part of the Christmas Dinner, the glaze in this recipe gives a wonderful sweet yet spicy flavour. Use Cloves instead of Star Anise if preferred. Soak the ham in a bowl of water for up to an hour to remove any excess salt. Place the ham into a large pot, cover with water and bring to the boil. Allow to simmer for about 2½ hours and turn off the heat allowing the meat to cool in the cooking liquor. Remove the ham from the cooking liquor and remove the outer rind. Score diamond shaped lines into the fat. Stud star anise into the layer of fat and put onto a baking tray. In a food processor, process the apricot and the water until a marmalade-like consistency has been achieved. Add the sugar, honey, barbecue sauce and ginger and process for a further minute or two. Spread the mixture over the star anise studded ham. Loosely cover with tin foil and bake in the oven at 150°C/300°F/Gas Mark 2 for about an hour or perhaps a little more, depending largely on your oven. Take the tin foil off at this stage. Brush any leftover glaze over ham and turn up the heat for an additional 20 minutes. Rest the meat for an additional 30 minutes once removed from the oven, before slicing.